He's moved out from our place leaving us with just the usual rivers of Baby Cobra bogies. Germs, germs, germs. The Cobra family have had so many of them this year that we were beginning to think that we had value to medical research. Of course, we blame Baby Cobra: she is a germ magnet. 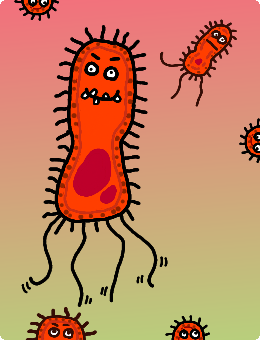 A cute one, but a magnet for microbes nonetheless. Even with MY artwork, this should be obvious... oh, and the first two often happen simultaneously. We have an official name for this germ: Tuesdicoccus Daylori. We feel that it is appropriate. As much as we hate this particular miniature misery machine, we have come to know it and we feel that it has come to know us, too. A sort of human-germ relationship that works on the basis that symptoms won’t kick off, say, at 8PM when boarding a Ryanair flight from Germany, but will start once we are safely home and the heating is on. For that ALONE, Tuesdicoccus gets a tickle of thanks. However, as much as we appreciate the infection-delay that allowed us to survive a packed flight with an eleven month old baby, we’re done now. So, please Mr Daylori and your millions of little brothers and sisters, it has been interesting and slimming, but can you move out now? I’ve packed your suitcases for you. This entry was posted in Miscellaneous rubbish and tagged cobra art, cobra family, eels, germs, infection, Tuesdicoccus Daylori. Bookmark the permalink. Let’s hope this contagion isn’t airborne as we may all drown in horsedung. Plus that centaur’s head is the wrong way around so he’s clearly in league with the devil. My art lets me down again. So down. Down.Down.